I love raw vegan walnut tacos. They’re crunchy, colorful, and bursting with flavor. I first tried them at a restaurant called Sage in Los Angeles. Those were delicious, but these are even better! The raw chipotle sour cream is to die for. The best part is, this entire recipe takes less than 30 minutes, including the sauce. Can we please take a moment to talk about how GORGEOUS this cabbage is? I am pretty much obsessed anything purple, especially purple foods, but this cabbage is on a whole different level. I can’t stop staring. There is something so satisfying about making food with such rich, vibrant plants. Vegan or not, you can’t deny the appeal of such lively dishes. 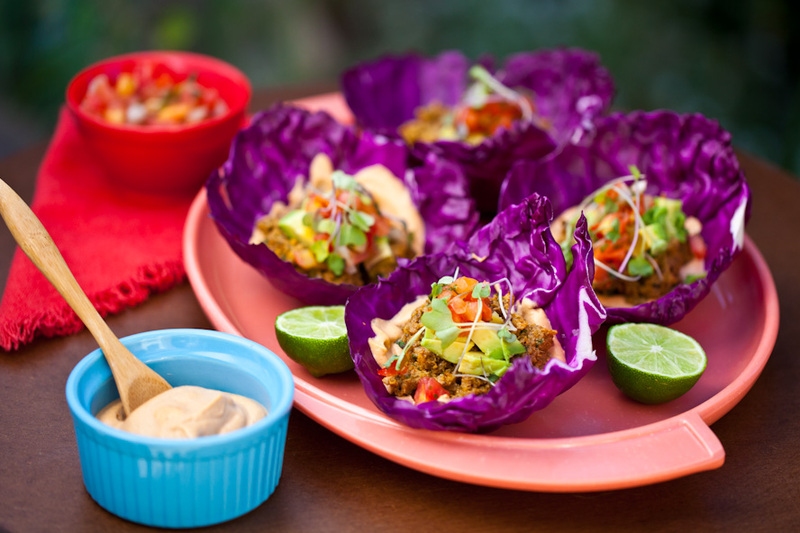 Another major perk of these raw vegan walnut tacos? How amazing you feel after eating them. Seriously, these raw tacos will fill you up but won’t weigh you down. They make the perfect lunch, dinner, or snack! I brought some to a beach picnic the other day and they completely hit the spot. I have been wanting to make chipotle sour cream for some time, but I didn’t want to use a processed dairy replacement. The idea for this recipe came to me in a stroke of genius. I usually keep soaked cashews on hand in the fridge or freezer for quick recipes. One day I threw some into my Vitamix with some pico de gallo and spices and the rest is history. It’s so easy y’all! I like to keep this on hand for vegan tacos and quesadillas, but it’s super delicious on just about everything. These raw vegan walnut tacos are crunchy, colorful, and bursting with flavor. Topped with raw chipotle cream, they are a crowd pleaser for sure! Combine the nuts, mango, pepper, green onion, olive oil, tamari, and all spices into the bowl of a food processor. Pulse until desired consistency, about 4-5 times. Spread 1 tablespoon of chipotle cream on each cabbage leaf. Add a scant ¼ cup of walnut mixture, then top each taco with chopped avocado, pico de gallo, and micro greens. Serve with sliced lime on the side. Chipotle Cream - Soak the cashews for two hours or overnight, then drain. In a high powered blender, combine the cashews with the pico de gallo and spices. Blend until smooth and creamy. This will keep up to 5 days in the fridge. *Time does not reflect soaking of the cashews. I like to soak cashews overnight and store them in the freezer to save time! Did you like this recipe? Share it with your friends! Or better yet, try making these Raw Vegan Walnut Tacos and post a photo of your creation on Instagram with the tag #carrotsandflowers 🙂 It will seriously make our day! For other tasty, healthy, raw vegan recipes, take a peek at our Raw Vegan Chocolate Shake or our Pomegranate Persimmon Salad. I am making these this weekend! Stayed tuned……. Awesome, let me know how they turn out! The only other place where I’ve seen raw vegan tacos is FullyRawKristina’s channel! Both of your recipes look stunning. I LOVE the choice of purple cabbage and the sour cream recipe! we are working on including printable recipes! we tested out one method and weren’t quite happy with the format. stay tuned and thanks so much for checking out our site! Do you think leaving out the oil will make much a difference in taste? We’ve made it many times both with and without the oil. It tastes delicious both ways! Really, you could just leave it out completely and it would still taste great. You could also sub a handful of those sundried tomatoes in oil. MMM! This is the 3rd raw taco “meat” recipe I have tried. It’s the first one with fruit in it and it’s so good! I actually haven’t found a bad one yet and both of my sons like them too. I’ve been making raw tacos every weekend 🙂 I liked the chipotle cream, but I think next time I would use a spicer salsa instead of pico de gallo but thats just personal preference. Thanks!